Rehoboth Beach Real Estate Delaware Beach Search Results - Real Estate - Rehoboth Beach, Bethany Beach, Dewey Beach, Delaware - Sand Castle Realty. "Shell House," the most spectacular private compound on the Atlantic Ocean and Silver Lake in the most desired location along the Delaware coast. This is an ultra-rare opportunity to own an oceanfront estate situated on almost an acre of ocean to lake property, consisting of two building lots (third lot option available). This spacious home originally built in 1920 boasts 7 bedrooms, 6.5 baths, multiple living areas, an abundance of outdoor living space and much more. The sprawling main level is excellent for entertaining with an oversized gourmet kitchen including a 6-burner gas range, two ovens, range hood, Sub-Zero refrigerators, ice maker, built-in microwave, marble countertops, travertine tile floors, wet bar area and butler's pantry. The expansive living room features a wood-burning fireplace, gorgeous exposed beams and antique tile floors. In addition, a formal dining room with hardwood floors and wood-burning fireplace, separate den and two wings, each with two guest bedrooms. Continue upstairs to find a luxurious master suite overlooking the ocean and Silver Lake, featuring a wood-burning fireplace and twin bathrooms. In addition, the second level includes two guest bedrooms with ensuite baths. Enjoy warm summer days in one of the various outdoor living areas including a beautiful courtyard with fountain, in-ground pool overlooking Silver Lake, oceanfront brick patio, formal gardens and more. Words cannot describe this property - it is truly profound. Discover this magnificent oceanfront Georgian estate in North Shores built to category 5 hurricane standards. A rare offering, this exquisite North Shores oceanfront estate boasts floor to ceiling windows with sweeping views of the Atlantic Ocean. With over 6,700 heated square feet and over 12,000 total square feet, this extraordinary retreat features stunning details throughout, including random-width reclaimed oak hardwoods floors, gourmet kitchen with 48 inch gas cooktop and Viking appliances, a heated infinity pool and spa, four fireplaces, ten wall mounted televisions, and endless custom details. Main level has entry foyer with barrel vault backlit ceiling, open two story great room with stone fireplace and built-ins open to dining room and gourmet kitchen. Enjoy the sunroom off the dining room overlooking the ocean or relax on the over 1,400 square foot ocean front deck with 16 x 22 infinity pool and spa overlooking the Atlantic Ocean! In addition there is a recreation room with wet bar off the great room and a powder room, office, and master suite on the main level. Second level features three more master suites and exercise room with powder room. There is a balcony off the exercise room and a large sundeck off one of the bedrooms. Third level is a large master suite with office, balcony, walk in closets, laundry, and luxury bathroom. Ground level has garage for four cars and large storage area. Elevator services all four levels. Construction details and plans attached - pilings driven down 75 feet into bedrock and encased with steel and reinforced with steel concrete grade beams. Over two hundred tons of steel was erected three full stories high. Six foot fencing surrounds the property and there are two motorized entry gates. Hurricane rated low E windows and doors by Anderson. Exterior walls are framed with 2 x 10's and interior walls are 2 x 6's with R-30 and R-40 insulation. Features central vacuum, heated pool, four fireplaces, reclaimed oak hardwood floors, five bedrooms, five full bathrooms, and two powder rooms! Pool mechanicals are housed inside on lower level. Truly magnificent home that is perfect for entertaining. North Shores features a community pool, tennis, marina, and private beach. Easy access to the bike trail in Gordons' Pond State Park. Enjoy convenient Rehoboth location with restaurants and attractions nearby. 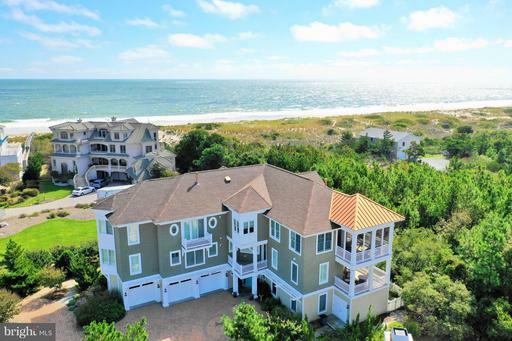 Start living the ocean front beach life today! Introducing 58 Ocean Drive, an exquisite oceanfront residence located in the sought after and private beach community of North Shores. Upon entering 58 Ocean Drive, you will be welcomed by sophisticated yet cheerful coastal decor. This excellent inverted floor plan was designed to maximize the spectacular ocean views from your prime living spaces. The first level features a welcoming foyer, garage, spacious recreational room,bunk room, half bath and mud room/laundry room that is easily accessible from your outdoor shower and beach. As you approach the 2nd level and main living area from the central staircase, you will be greeted by panoramic ocean views, soaring ceilings with intricate trim work and detail throughout. The open floorplan is ideal for entertaining or simple relaxation with the sound of the waves crashing in the background. The gourmet kitchen includes commercial grade appliances, custom cabinets, large island with breakfast bar and pantry. The kitchen overlooks the spacious yet comfortable great room and dining area each offering direct access to the oceanfront screened porch and sprawling sun deck. This level also includes a cozy den and an executive office complete with beautiful custom built-ins to maximize the space. Once the sun sets, retire to one of the 3 spacious bedrooms with en-suite baths or travel to the 3rd level featuring the oceanfront master suite complete with a private sun deck, spacious custom walk-in closets and spa like bath. In addition, the 3rd level includes another private suite offering a total of 6 bedrooms and 6 full bathrooms and 2 half baths. 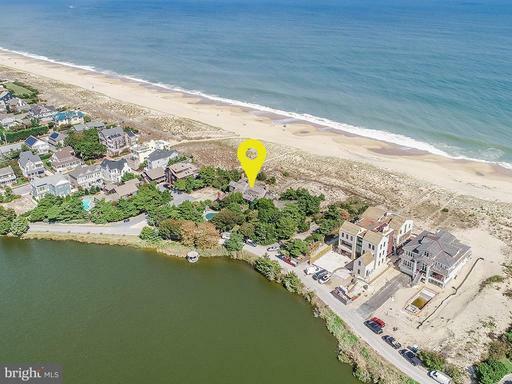 North Shores includes numerous amenities such as a private beach, swimming pool, tennis, and marina, all adjacent to Cape Henlopen State Park and the popular Gordons Pond Trail. 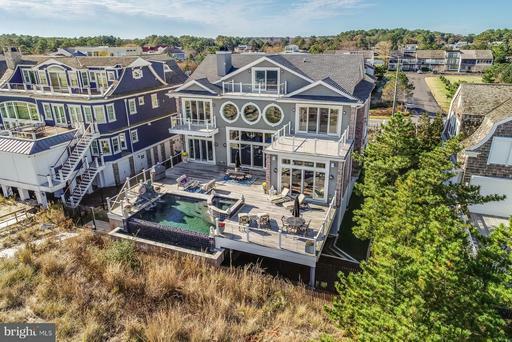 Enjoy beautiful ocean & Silver Lake views from this stunning new construction home in the ocean block of South Rehoboth. This home will not disappoint any buyer with unparalleled quality finishes and attention to detail. The stone floor front porch and gorgeous solid mahogany front door set the stage for the impressive interior that is flooded with natural light. This home boasts almost 3,200 SF of exquisite indoor and outdoor living spaces including 5 bedrooms, 4.5 marble tile baths, inverted open floor plan, elevator, vaulted ceilings, wide plank oak floors, two fireplaces and unfinished basement. The gourmet kitchen features floor to ceiling custom cabinetry, quartz counters, large island perfect for entertaining and Wolfe/Sub-Zero appliances. 1st and 2nd floor master suites and 5th bedroom easily utilized as an executive office or den provides versatility for any buyer. The ocean sunrises and Silver Lake sunsets from the ipe wood balcony covered by a beautiful pergola with retractable awning is a feature that only this location can offer. 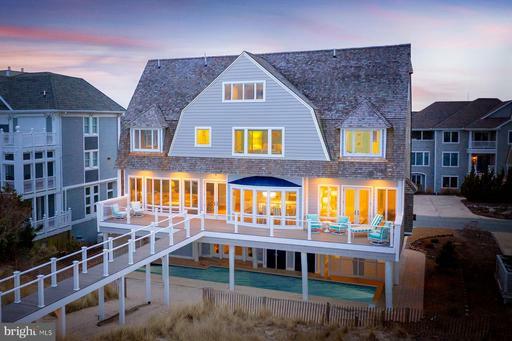 The list goes on and on and and it is one of the more special homes offered for sale in Rehoboth Beach. 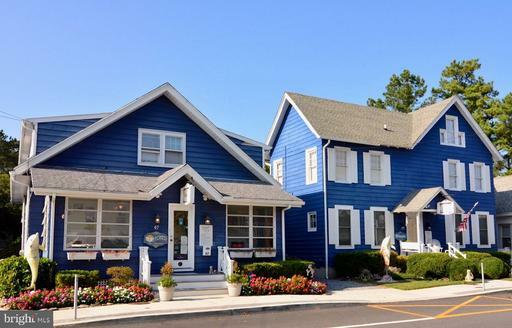 This well-established award winning B&B located in the heart of Rehoboth Beach, Delaware has years of successful operation and tons of repeat customers and is already booked into the 2019 summer! The B&B includes 2 downtown separate yet conjoined properties located on Lake Avenue, just 2 blocks from the beach! In total, the B&B has 14 bedrooms and 13.5 bathrooms, 2 full kitchens, and owner~s apartment, a private backyard, large deck, sunken hot tub, 2 outdoor showers, and 14 free off street parking spaces. All furnishings and decor, including collectible memorabilia, are included with the sale. Continue to run the B&B, operate as a rental, have a family vacation home, or split into two personal residences. 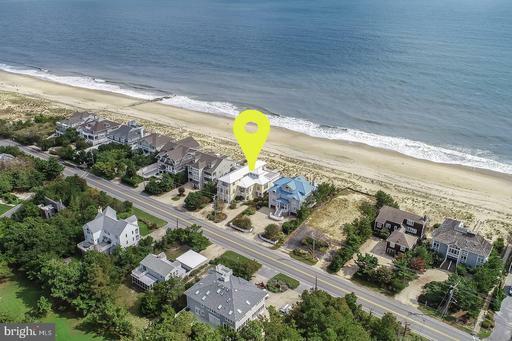 Amazing Ocean Block property in North Rehoboth. Completely renovated with detached garage for guest overflow. Easy flow design to entertain. Charming and Classy. Quality craftsmanship. Cozy for year round, a rental, or vacations!Steps to the action of town, dining, and shops. 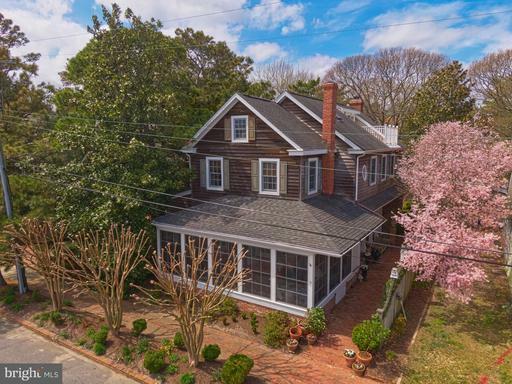 Unique, spacious and charming home in Rehoboth Beach just steps from the ocean. This home has 6 bedrooms, 4 full baths, and 2 half baths in the main house with a guest house on the property with a living space, gas fireplace, kitchen, bedroom and full bath. Inside the main house you will find tiger maple floors on the first floor, wide plank pine on the second floor. There are two living rooms each with a wood burning fireplace, updated kitchen with large dining area, 1st floor master suite with fireplace, separate laundry, walk-in closet, and two marble bathrooms. On the second floor are 4 bedrooms, 2 full baths, and laundry. The third floor boasts an office space, sitting area, bedroom and half bath, plus a balcony with ocean views. The many decorative features include painted floors and walls. There is a front porch with screens and plexiglass storms, brick rear patio, fully fenced back yard, and an outdoor shower. This home also has a finished basement with pool table, workshop, and a 1500 bottle wine cellar. This house could not be built under today's building code.